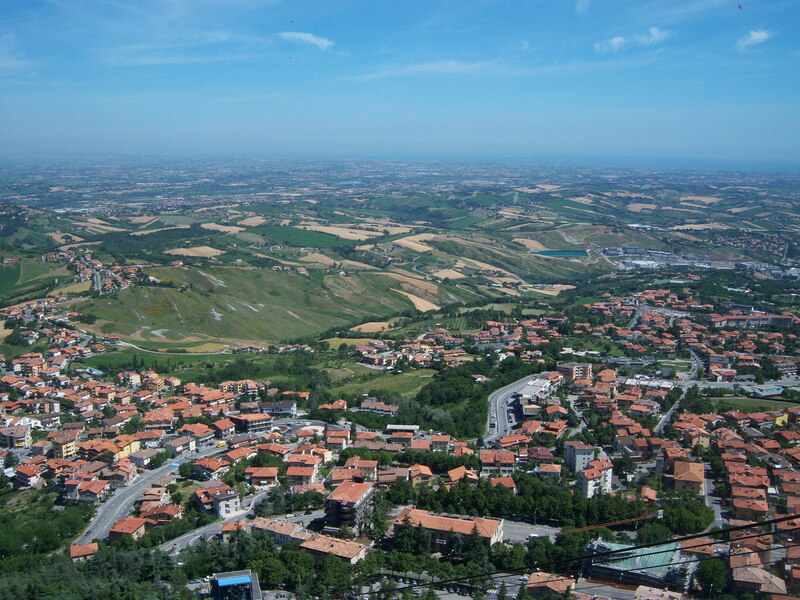 Tucked atop a mountain in central eastern Italy is the tiny republic of San Marino. Considered to be the oldest republic in the world with a constitution dating back from 1243. The people of San Marino chose not to become part of unified Italy in 1861 and Giuseppe Garibaldi honored their wishes. A winding road leads us to San Marino, a mere 25 miles or so away but taking an hour and half due to the climb and speed limits. Once there we parked for a fee, that only be paid with coins, and continue the upward climbs walking. We were guided safely into the city by a uniformed guard. What I found most impressive were the panoramic views of Italy. 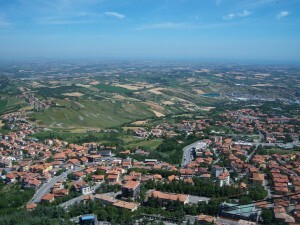 You can see across the plains of the province of Emilia-Romagna all the way to the Adriatic Sea. 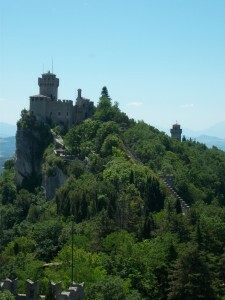 San Marino protected itself with the help of three towers. You will see these towers as a symbol of the country on seals, postcards, etc. The towers are still standing and 3 euros will allow you to visit one of them. Again it is the view rather than the tower that seems to make the money worth it. The travel books suggested eating a Torta Tre Monti or “Three Tower Cake.” After discovering that this could only be bought, packaged in a store, my dreams of towers of chocolate were dashed when I found a flat box on the shelf. It is a large, layered wafer cookie dipped in chocolate. Mike said it was a good cookie; my disappointment hasn’t allowed me to take a bite yet. There are many shops and eateries. We found most of help staff to be unfriendly, not so with the numerous Italian places we have visited. One in particular was the lady who staffed the tourist office. You can go there to get your passport stamped after paying 5 euros. I gave her a twenty and she seemed most put out, asking if I had anything lower. I wanted to break the twenty because you need smaller bills or coins for parking machines, restrooms, tips, etc., so I told her no. She responded with a warning that I was getting all coins in return. I told her that was great. She then barked back that they would not have San Marino on them. I explained again, that it was fine. I was pleased with my stamp and she seemed pleased when I left.